ADG 3D Tools for 3DStudio MAX®. Plug-in for 3DS MAX 4.0 - 12.0 �. Copyright � 2000-2010, Albatross Design Group, Inc. All Rights Reserved. ADG 3D Tools (ADG Exporter & ADG Viewer) enables file export from 3DS MAX to ADG File Format developed for Web Publishing (Albatross Design Group, Inc. File Format, Copyright © 2000-2010.) 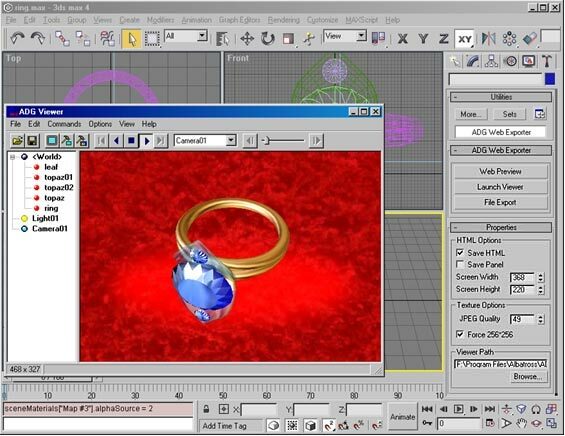 ADG 3D Tools has a built-in ADG Viewer for fast viewing of 3D scenes in ADG File Format. No HTML or Java programming knowledge required! ADG Files can be viewed through ADG Java Viewer that eliminates a Plug-in installation and gives a platform independent use on the Internet. ADG Exporter is distributed within a single file ADGexporter.exe , so simply launch ADGexporter.exe file to start installation. The installer will automatically detect your 3DS MAX ® directory and install ADGview.dlu plugin into appropriate plug-in directory. ADG Direct3D Viewer will be installed into your system Program Files directory, Albatross subdirectory. If it has a problem locating 3DS Max directory, please, find it manually. As usually it is c:\3DSMax\Plugins\ , or you can get it from 3D Studio MAX ® Help. Installation does not affect any Windows system files, so there is no need to restart your computer after the installation. Use Start/Programs menu to launch ADG Exporter Sample file. Use corresponded icon on desktop to launch ADG Viewer . Note: ADG Viewer requires DirectX Version 6.0 or higher to be installed. You can download the latest versions on Microsoft ® Web Site. 1. On the Utilities panel, click More, and select "ADG Web Exporter". 3. In the Select File dialog box, choose a file name and click Open. 2. In the Select File dialog box type a file name and select location for the saved file, then click Save. Embedding ADG Composition into Your WEB Site. Press File Export button to store composition into .ADG format file. HTML page will be created automatically, for example "yourfile.html" . Upload files ADGview.jar, "yourfile.html", "yourfile.adg" you've just created earlier to the apprppriate Web Site Directory. Use a standard Web Browser. Type proper web address of the HTML page "yourfile.html", you've just uploaded. No special plug-in required. The Trial Version of ADG 3D Tools is fully functional except for a watermark "Unregistered" in ADG Direct3D Viewer and ADG Java Viewer. To purchase a Registration Key, please click here and follow the instructions. Upon confirmation of payment, you will receive a registration code by email. After launching this Registration Key, registration reminders will cease and watermarks will no longer be added to your 3D scenes. Try it for free, buy it for just $199.00!